We just took out the Christmas decorations yesterday and found this old chestnut. It still invokes terror in some and warm fuzzies in others. Remember when you were a kid and you read the Little House on the Prairie books that told about how Ma made Laura a rag doll for Christmas and how wonderful and heartwarming that sounded? 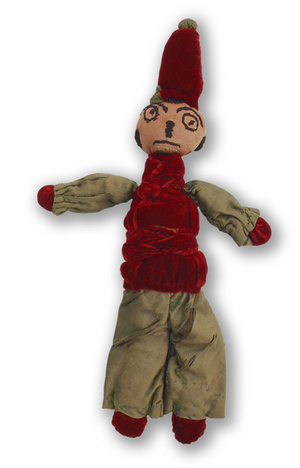 And remember when you actually saw a home-made rag doll for the first time, you were shocked to learn that rag dolls actually resemble evil court jesters? I bought this doll at (surprise) the thrift store. I personally consider it a beautiful piece of folk art and marvel and the luscious silk velvet, faded taffeta and cotton hosiery material of yesteryear, while my boyfriend thinks it looks like something straight out of a horror movie and throws it across the room any time it gets anywhere near him. Vive la difference! It just goes to show you that beauty is in the eye of the beholder and what is art to one is a creepy evil court jester to another.